It’s gotten to a point where an ordinary consumer isn’t wowed by advances in storage technology. Oh, we can do this now? Great, I’ll expect it to become a standard performance feature. We’ve simply come to expect that bigger and better is on that tech horizon. The trend towards more spacious storage capacities on USB drives is just one sign that our future is mega storage. While the ordinary person may not have need of huge storage capacities, it may come to be this will change as well. 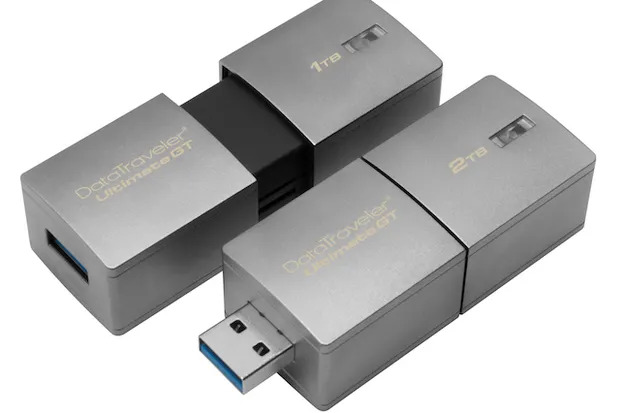 Two of the biggest flash drives made by SanDisk and Kingston are the largest and greatest capacity drive that are (or will be) on the market for purchase. Unfortunately, this one is still a prototype. 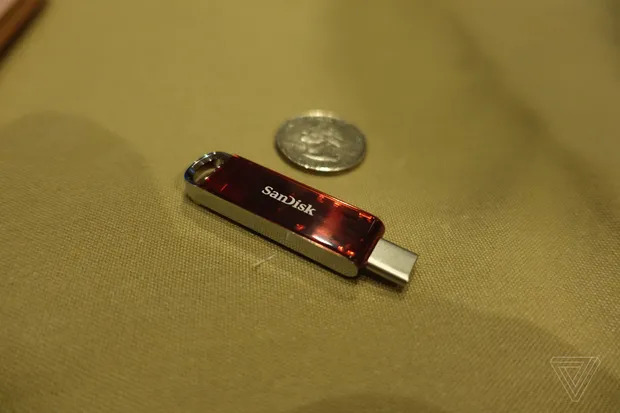 SanDisk revealed their new innovationat this year’s CES convention in Las Vegas. It, and neither have its specs, been released yet, leading online posters to wildly speculate about transfer speeds and performance. We do have an image of it, however. It is surprisingly discreet, and operates using a USB-C port (thus allowing for quicker transfer speeds) and it will be able to connect directly to Android devices as well as iPads and iPhones if you have the correct dongle. In any case, the 1TB of space is impressive. Most average consumers don’t need more than 4 GB of storage for their documents and keep everything else on a separate (expensive, usually heavy and cumbersome) hard drive. A terabyte is about 1000 gigabytes, one million megabytes, or 1000 million kilobytes. This means that you could easily store a library of movies, music, video and photos without running out of space. SanDisk has not yet released the cost of this magnificent device, but it’s likely to be more affordable than the next mega storage option. Kingston released their DataTraveler Ultimate GT 2TB flash drive in 2017, and it certainly looks the part of a heavy duty storage device. It is quite large, especially in comparison with SanDisk’s projected model. Still, considering the fact that only a few years ago this amount of data storage was available only to huge enterprises and government bodies, it looks pretty good. The price is a different matter, unfortunately. It retails for between $700 and $1600. Kingston’s 1TB costs about $900 on Amazon but does go on sale occasionally. Performance wise, it can read 300MBps and write at 200MBps. It supports lots of operating systems like Windows, Mac, Linux and Chrome. As consumers, we want the best we can reasonably afford. Currently, these devices are out of the reach for the masses but like the computer and the smart phone, prices will probably eventually come down to a reasonable degree. Just a few years ago, it was unfathomable that a person should need or desire to store a sizable amount of data but in today’s world of photo-centricism and on demand videos and movies, that reality has swiftly changed while the market has risen to meet its demands. We want to keep all of our memories in an easily viewable and retrievable space while storing our favorite TV episodes, Facebook live videos, and precious moments caught on smart phones. It is quickly coming to a point where an average consumer is unhappy with the typical storage capacities they can easily find in a big box store or purchased online. While cloud storage was inevitable and is often cited as the future downfall of USB drive type devices, its downsides are considerable. Early opponents of cloud technology cited huge security risks that just aren’t nearly as endemic to flash drives or exterior storage devices. This is because cloud technology requires the use of the internet, thus making it a target from would be hackers. Despite this, it has quickly become nearly the de-facto storage option for many corporations today. Typical consumers may use both but the USB drive is advantageous in that it can be formatted and be used flexibly, does not require internet, and poses a smaller safety risk than cloud technology. Additionally, Cloud technology requires power and a sizable amount of space to house servers whereas a simple flash drive just needs a pocket or sleeve and a computer to function. Flash drives are also a onetime cost whereas cloud storage often requires a subscription that can be limiting, inflexible, and extremely costly depending on the type of business you are using it for. You may also not be able to transfer data over to another system later. It’s unlikely that cloud technology will completely eliminate the need for physical USB drives. They are often paired together for a consumer’s needs, offering flexible storage and data transfer solutions. Rising consumer expectations of technological performance standards are pushing drive manufacturers towards extreme data capacities, like the 1 and 2TB drives from SanDisk and Kingston. Both consumers and businesses deal with previously unimaginable amounts of information that needs to go somewhere. A huge fluctuating global market requires technology that can keep up and stay one step ahead to better manage demands. With consumer data compounding upon itself and a consumer market driven towards expecting better set standards, the future is most certainly one full of mega data.